Tokyo, Japan - Panasonic Corporation will celebrate its 100th anniversary in March 2018. 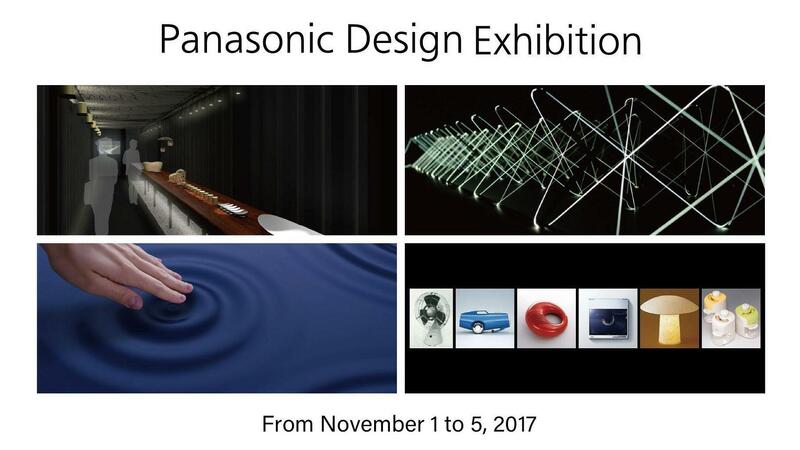 To mark the centennial, Panasonic's Design Division is organizing the "Panasonic Design Exhibition" from November 1 to 5, 2017 at Tokyo Midtown (Roppongi, Tokyo), which will give visitors a look back at Panasonic's design journey as well as a glimpse at the path forward. This exhibition is taking place at the Tokyo Midtown Courtyard as part of the "Tokyo Midtown DESIGN TOUCH" that is being held to coincide with the "GOOD DESIGN EXHIBITION 2017," which is also taking place at the Tokyo Midtown. Eighty-four designs from Panasonic are being awarded at the GOOD DESIGN EXHIBITION 2017, 5 of which have been selected as the Best 100. Winning designs are being showcased at the GOOD DESIGN EXHIBITION 2017 (various locations within Tokyo Midtown). The theme of the Panasonic Design Exhibition is "Hands-on Innovation." Panasonic has placed people at the heart of design, discovered new insights, and has given shape to ideas. "Hands-on Innovation." expresses Panasonic's desire to bring innovation to lifestyles and to society by drawing on the DNA cultivated over the years as a home electronics manufacturer. Panasonic showcases cutting-edge design prototypes that reflect this desire and answer the question, "What will make life better next?" There are also products on display that will give visitors a look back at Panasonic's design journey. A collaboration between a creative unit of craftspeople from Kyoto, "GO ON," and Panasonic Design. State-of-the-art electronics meets traditional craftsmanship that has supported life in Japan for many centuries to create designs that will enrich lives in the coming century. The next generation light device, laser, is highly directional and very efficient even at high intensity. Taking advantage of these features and by weaving fiber like gossamer threads, the collaboration has created lighting that brings new value to spaces. Conceptual models of home electronics that depict what life in Tokyo may be like in 2030. By adopting advanced technologies and services, Panasonic has designed a lifestyle that amplifies humanity. Over the years, Panasonic has continued to birth designs that have met people's needs. In light of its 100th anniversary, this section will take a look back at Panasonic's design journey, showcasing much-loved products. Please come see the actual products as well as the 3D signage that stimulates the senses.